I have been spending quite some quality time on twitter and reading useful blogs of others. As I am writing, I am still continuously trying to figure out what may be the correct focus to direct this post. Social media has always been a very skeptical form of marketing for alot of traditional marketeers as there is no clear ROI or statistics which can be provided as a base for business. Especially in the context of Asia, where almost everything must be "seen" or "touch" to "believe". However, this may all change with evolution of statistical tools on individual social networking platforms and most of all, the recent launch of Buzz Gain. If you need to get excited over something, then this must be it! 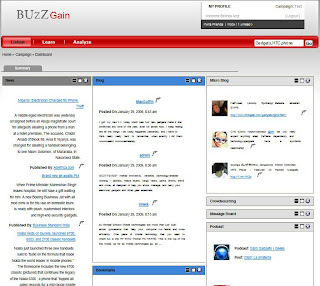 Currently in Beta stage (Free for limited period), Buzz Gain is a really simple web-based client that allows you to track over 100 social networking sites and search your keyword on blogs, microblogs etc. This allows a complete consolidation of data, including listening to all the important conversations about your product or business all in one site. Learn about who you should be tracking or following. And at the click of a button, analyze your demographics as graphs are created automatically to explain trends! Now you know WHO is looking and talking about you, WHO you should be talking to and WHAT are the results or outcome of the conversations. Finally a one-stop and affordable solution to all Social PR headaches. Although I wouldn't say the program is perfect just yet. Afterall, it is still in beta launch. One of the biggest turnoff is its speed. The program would have been close to a wonder if it loaded up nicely and promptly too. The beta version may be showing signs of lagging and delayed information. More insights of analysis and information can also be developed, hopefully at a later point of time. But at the very least, if you have no idea where start on your social PR, now here's a useful assistant. The service would probably have very large potential in Asia also, especially in China. With latest stats by Internet World Stats, China's internet population leads the world with approximately 253 million internet users end December 2008. And we are looking at a merely 19% penetration of its entire billion population. Imagine how much this service could potentially do for clients wanting to enter the dragon's gate? There are over 578 million internet users in Asia alone (versus 885 million in the rest of the world), where rising markets like India only has a 5.2% internet penetration currently. (Statistics are quoted from Internet World Stats) With the consumer market so saturated in Europe and America, brands and businesses are quick eyeing on the big piece of cake in the less-than developed far east. However, Asia's consumer behavior and internet trends may differ with those from the West, with their own specialised and isolated platforms (such as qq.com in China). And these are usually quite contained within their own communities. Hence services such as BuzzGain will need to obtain a better and more thorough understanding of the system to efficiently get it right. Even as a fellow Chinese, I'm finding it tough to keep up with the lighting speed trends of the China market. Their growth is tremendous and they are quick in developing tools that match those of the West. Moreover, the web structure in the east is not as organized and there are alot of "noise" to filter before actual contents and conversations can be read and analyzed. Hence adequate time will need to be invested to study the market in detail. In the meantime, I would like to give a pat on the shoulder of the BuzzGain team. If you haven't signed up for a demo, do so today. You'd be pleasantly surprised at the convenience it provides. And if you have a word to say to BuzzGain, feedback on how you think it could help you better, or just thank them for the wonderful innovation, give a BUZZ to @mukund on twitter. The fine man will be more than pleased to hear from you. Thanks for the great writeup. I hear you on the speed. That's the #1 focus for us on making the product quicker to respond. Love to keep having you give us more feedback to make the product better.